Despite the many - ok, hundreds - skirts I've worn on the blog, trying to find the perfect neutral coloured skirt that isn't black or white has been an on-going struggle. This camel skirt has officially turned into the fail-safe skirt for fall. The front zipper detailing is definitely an unexpected surprise and the faux-pockets are a nice touch. The only factor that stops it from being 100% perfect is the fabric after a long day of sitting. I was definitely trying to beat the wrinkles out before this shoot but it didn't go over so well :( If you aren't sitting all day long, a good iron before you head out the door works wonders with the shape. 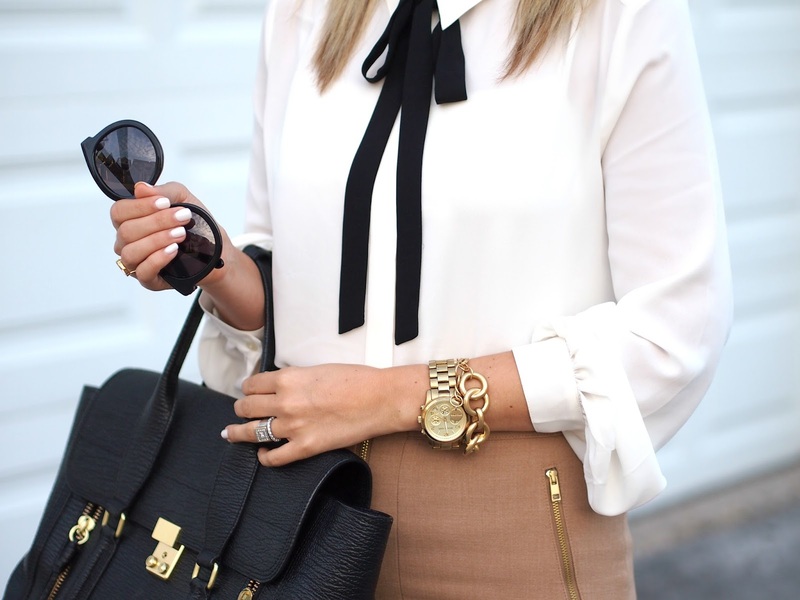 Love this combination - so classy & chic! Such a classy and stylish outfit! LOVE your shoes and blouse! love this look for work!! Love the color of that skirt! I'm wearing a very similar one today! Gorgeous look, the leopard heels make it so much better! It looks like you got the wrinkles out pretty well! I love the skirt, it really is beautiful.